In Venezuela we are living a rough economic crisis, clearly caused by internal and external factors that want to retake control of a country full of resources, in parallel infested by problems of corruption, inefficiency and bad decisions. In the midst of this, the news talks of street protests and blockades in the country because the government has not been efficient enough to deliver some 20 thousand tons of pork legs (10 thousand tons imported and 10 thousand tons of domestic production) in all the CLAP and places where they had been promised. You can not accuse people of being conscienceless by protesting or being upset by the problems in the delivery of the legs, when it was from the high government that the legs were promised through all the media, for the second year in a row. In any case, let’s be self-critical and acknowledge our guilt as government officials, before pointing to people who have their reasons for being upset. President Maduro and some members of his government have had the best of intentions when ordering operatives for the delivery of “perniles” and “combos hallaqueros” [bags with ingredients to make hallacas], which did reach a significant number of people. The perniles are offered through the CLAP to Bs. 500 (the ninth part of the minimum monthly salary, which is set at Bs. 4,500) for a boneless leg of 7 kilograms, although in supermarkets the price of the pernil is at least Bs. 3,500 per kilogram (one “pernil” of 7 kilos costs Bs. 24 thousand). In some cases, the organization in the delivery operations was good; in others, it was disastrous, forcing people to line for 10 hours or more and suffering intolerable abuse. In other cases, there were not even operatives because different communities and CLAPs were discarded. Anyway, we noticed that the protests on the issue of the leg are not protests demanding a change of government (although in many cases they did demand the resignation of the local structures of the CLAPs). Nor were they massive but punctual; they do not look like the “guarimbas” of 2017 or 2014 in the least. This is due, in my opinion, to the fact that there is a clear difference between a Nicolás Maduro who at least tries to satisfy the needs of the people, in contrast to an opposition and businesses that rather bet on the disaster and have most of the country upset. What we all want is for Maduro and his government to do it better and for their efforts to reach the entire population that needs it. From the beginning we noticed through Twitter that the 20 thousand tons of perniles (20 million kilos) would hardly reach 6 million households that receive CLAP, unless they were chopped and delivered approximately 3 kilos of pernil per family. However, messaging networks appeared all sorts of cross-information: some said that the 7 Kg. had to be delivered whole, and that “it should not be allowed” that the legs would be cut. Then, we learned that the legs were being chopped, in some cases at 3 kilos per house, in others to kilo and a half per house or less. There were even places where it was clarified that the legs had to be delivered by house and not by family, because in some cases at the same house there are several families living there, each of which wanted its own leg. We also learned that there were other sectors where whole legs were delivered. In other sectors the legs were not enough for everyone, not even chopped, so they were raffled off or handed over only to the street leaders of the CLAP, leaving all the others without the precious pernil. There was no explanation of why in some areas they were delivered whole, and in other chopped, drawn or even nothing was delivered. But evidently, it is not something that was the fault of the street manager; those are decisions that were made at other levels much higher, at the municipal or state level: people who unfortunately will never face or admit their fault in this disaster. Without pretending to justify the cases of corruption, cronyism, preferences to groups or sectors or possible discrimination (“not certain neighborhoods, because they are opponents”), we must also put ourselves in the place of those who had to put their face in front of people. I can not imagine what a “free appointment and removal” worker (the so-called “99” or trusted positions) should feel to receive a call at 11 o’clock at night to tell him that the next day he has to organize a food delivery operation. Many times without sufficient transportation, without adequate spaces, without personnel to make a decent organization. They call desperately the most committed people to work as volunteers in an operation of these, and with such a large level of improvisation, it is inevitable that many of these operations end up being a disaster. And a person in a “99 position” can not say no , because doing so means practically having to deliver your resignation the next day. It’s not the best time to be out of a job, right? For one it is easy to attack these people, but the truth, could we have done better instead? Obviously they are not to blame either. Imagine other cases: workers, drivers and workers of mayorships, governorates and other institutions that were called to have to be working until late at night in the delivery of “perniles” and food. While in many other public institutions the Christmas days were given as collective vacations and many public employees are going through a much-deserved rest, these people who have had to work hard these days, dealing with very unhappy people to get these foods , only to realize that many people like them despise them because they are the ones who show their faces, and it is humanly impossible for them to make deliveries to all the expected sectors, in a reasonable time, with the available resources. For that reason, I think it is a mistake to blame these people, who in most cases are making a great effort to do their work well. The fault is not theirs neither. What do we look for with socialism? No, I do not agree with the Chavez comrades who try to call the calm insinuating that this is our fault, because whoever wants a pernil has to spend a whole year raising a little pig in his apartment, or in his little house in the neighborhood, many of which do not even have a little patio where to put a slaughter house. It is true that this is a normal custom in many towns in the country side. But, for better or worse, more than 60 years ago our grandparents and parents decided to emigrate to the big cities, and we have to deal with that decision. We do not seek to build a country where everyone has a little pig, some chickens and a potato crop in their backyard. Do not misunderstand me: I am in favor of urban agriculture, and whoever wants to use his house to produce, let him do it! But we will never succeed in building a socialist country by destroying all current industries and doing everything in our homes. Quite the opposite, we seek that the industries be reborn and flourish, but with the people empowering themselves of the means of production and making decisions in them more oriented to benefit the country, than to benefit a few entrepreneurs [or themselves]. And far from building a “revolutionary bourgeoisie”, which is nothing but the same “cachimbo with different musiú” [venezolanism for the than thing]! Our aversion to capitalism can not make us also against industrialization and mass production. 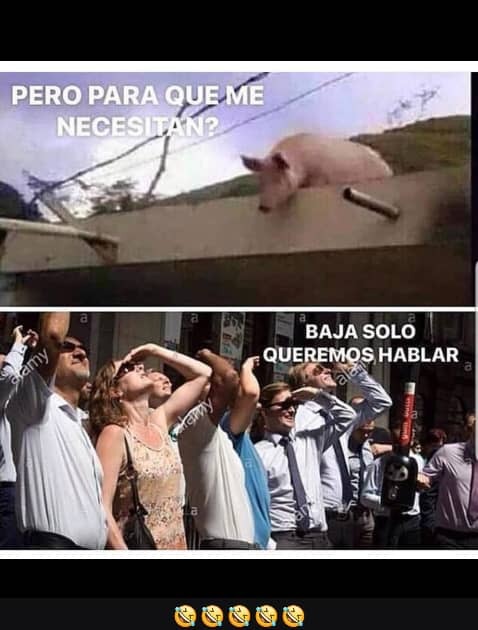 While it is true that it is ridiculous to raise a pig in every apartment in the country, we also have to ask ourselves: Is Venezuela a country whose traditions require having a pernil at the Christmas table or at the end of the year? I have asked many people if in their families it was normal 10 or 15 years ago to have a 7 kilo pernil at the Christmas table, and many people say no. The Christmas dish in Venezuela revolves around the hallaca (a kind of tamale or cake made of corn flour teniño with onoto, stuffed with a stew of meat, chicken, pork, olives, raisins, capers, paprika, onions and other elements, wrapped in platain leaves). The hallaca is served together with “pan de jamón”, chicken salad and a little bit of pork but the protagonism always has been the hallaca; the contours of the Christmas plate can vary according to the region of the country and the purchasing power of each family. There we have to ask the comrades of the government: Are we implanting unnecessarily and in the midst of a crisis like the one we are experiencing, the need in people to have a “pernil” on the table or else they will not have a “happy Christmas”? Are we making the same mistakes that we attribute to capitalism with its blatant Christmas consumerism? Maybe this is the least propitious moment for that. What I want to get, is that although these operations are very well-intentioned and you greatly appreciate the President and the ministers, mayors and governors who have been waiting for their best results, it has been known for months that these operations were going to happen, but unfortunately, at the time of the distribution, we did surrender to improvisation, the absence of planning, the terrible organization, the lack of clear rules and decisions based on totally subjective criteria. We continue with the tendency to place people without experience in positions with intense activities, making them work 18 hours a day, seven days a week until they explode, until they get the last fiber of vitality, and then, after a few months, when they no longer yield, we discard them, we change them to another position and we put another friend without experience to start from scratch, to suffer again the same. We call this “loyalty.” Is there really no other way of doing things? What we want is to begin to build a socialism sustained in planning, to industrialize the country, where workers can make a career, gain experience, want to stay working, can fulfill their tasks in an efficient and planned manner, using current information technologies to ensure that everything reaches everyone, and that people do not have to suffer by making huge lines or waiting hours or days for something that should be delivered in 10 minutes. We want the arbitrary decisions to stop, taken in by people who do not show their faces, who are not on the streets dealing with problems, and who make their decisions based on cronyism or cheap politicking rather than on statistics and scientific criteria. In spite of everything, people still prefer our incipient socialism, with its mistakes, to the despicable capitalism that we had before. That shows how bad the IV Republic was! Let’s not abuse, however the need of people, and refuse to improve. Let’s not forget what happened in Argentina or Brazil; let’s not forget that part of the abstention in the last Venezuelan elections was a silent protest against our mistakes. Let’s correct them now!